Family oil portraits can be done in either a formal or informal setting. I’ve recently been commissioned to do these two delightful portraits of families – each of the works as a surprise for a spouse. In addition the grouping of family members can also be either formal or informal. We would start with your ideas, and progress to several photos taken professionally by my photographer. For a family portrait we would need to decide on the size and shape that would best fit on your wall, as well as the color scheme in the room you want it placed. If possible, ideally each person would also come to my studio at the final stages for a 90 minute sitting. A family oil portrait offers so many other possibilities in addition to being displayed proudly in your home. 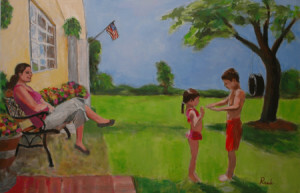 Each member of your family can have a museum quality Giclee copy of the family oil portrait. This group portrait can also be made into notecards and holiday cards, as well as used in other ways. It would be my pleasure to paint a family heirloom for your wonderful family. 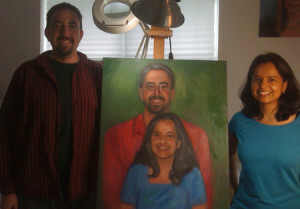 A family oil portrait captures your family at a special time and can be a source of ongoing pleasure! !